Bluetooth wireless connectivity, Support USB/TF card, Built-in FM, AUX function, Rechargeable Lithium battery, Built-in microphone, Hands-free call. We are a top notch supplier of Zebronics Portable Speaker. We are amongst the most reputed names in the industry, offering Zebronics Portable Speaker. 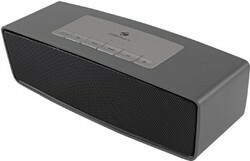 Banking on our enriched industry experience, we are able to supply Zebronics Portable Speaker.